Bumble Bee (Genus Bombus or) on Anemone hupehensis 'September Charm'. Lovable Bumbles are the hardest workers in my garden. Bumblebees will work when it's cool and cloudy, unlike the honeybee, which needs a warmer, sunny day to bring them into the garden. Bumbles will visit the earliest dandelion and stay around till the last aster disappears. I've often come across them sleeping on flowers early in the morning. The above photo was shot earlier this summer, but it typifies a sleeping Bumble! Don't you want to pet them? I have and they usually sleep through it! I love the Bumbles. play an important part in pollinating plants in my corner of the garden. Honeybees get all the attention, but, we need our native bees. I garden in the Eastern Broadleaf Forrest Ecoregion. * About 15 states make up this 127,000 square mile province that includes low rolling hills, flat areas, cedar glades and barrens and elevations from 80 feet to 1650 feet. What sets this area apart is the abundance of both oak and hickories. It includes US hardiness zones 2b through 7 bc! Talk about diversity! During the last several years I've made changes to my garden to attract more pollinators: like planting more herbs~~especially mints, annuals like zinnias and even more native plants. The Pollinator Partnership is a good resource if you want to learn about pollinators and what to plant in your garden. You can visit them here. You've surely guessed! My favorite of the native bees are the bumbles! Technically, Bumbles are generalists, because they don't require any specific plants. They are not picky about nectar and will visit almost any nectar producer. Experts say bees like bright white, yellow or blue/purple flowers. I've seen them on every plant in this garden. Cup plant with wasp, possibly a paper wasp! The tiny wasp waist is a giveaway to its ID! If you're aiming for diversity...You have to accept all visitors to the garden! Wasps visit the plants, too. Bees and wasps are members of the Hymenoptera family. (That name always makes me think of mummy movies). While wasps aren't considered true pollinators, they do have a role in our gardens; as predators of harmful caterpillars and other bugs. Not a perfect guest, they do get the good caterpillars, too! Their presence isn't big here until early fall when sedums bloom and a bit later when the native asters appear. Honey bees are not native to North America...they were brought to the US about 400 years ago, but, our agricultural industry is dependent upon them to pollinate some of our cash crops! The Bumbles are major pollinators in my garden and in yours. If you grow tomatoes, you want these guys in your garden. Wind isn't as effective a pollinator for tomatoes as the Bumble. They also pollinate orchard crops, berries, watermelon, sunflowers and other fruits. to move more often between rows of plants? Ah...competition is good! this is one of my favorite shots...enlarge to see how pretty the lapel pin looks! Bumbles live in/form small colonies that are usually underground. I leave some bare ground for bees that tunnel into the soil for nesting....They are known to move into abandoned mouse nests! I sure would rather have bees then mice and voles! to have them in our gardens! But, there are a few practices that encourage them to stay! Plant many different flowers that bloom over the entire growing season to encourage different native bees to move into your garden. Plant flowers in drifts....It increases pollinator efficiency and looks prettier! Plant night blooming and fragrant flowers. Make peace with clover and dandelions. Let our gardens be a little messy, so that there are nesting places and shelter. If you want to encourage a diversity of pollinators~~ you will need to provide open areas (e.g. bare earth, large stones) where butterflies, may bask, and moist soil from which they may get needed minerals. 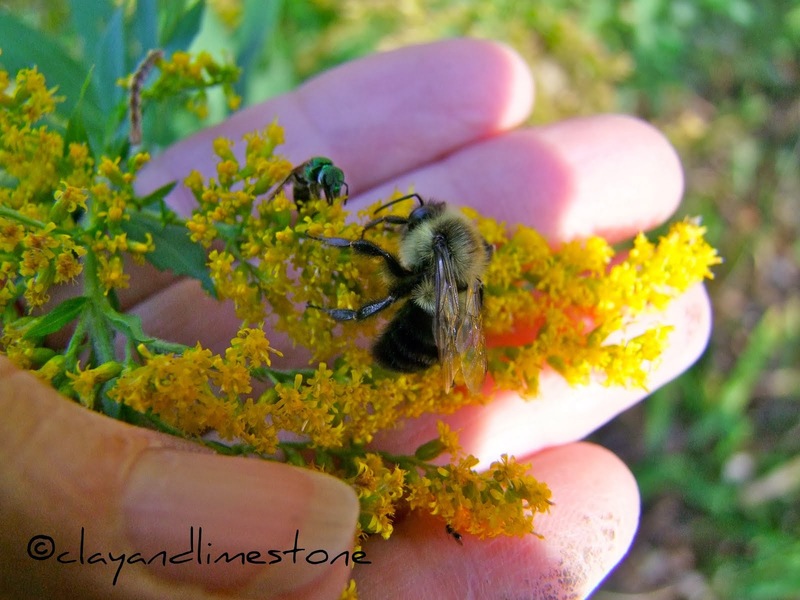 Accept that when we invite pollinators into the garden, plants will get eaten and look ratty for awhile. You know this started out to be a short photo essay of Buzzers in my garden! But, one internet search and voila! What better way to celebrate labor Day then a nod to the hard workers in our garden! Thanks for stopping by~~I hope your holiday weekend has been good. Loving your Ode to the Bumblebee! P.S. I'm doing my bit with the messy garden part. Gail, What a wonderful and informative post! We gardeners can provide a lot of flowers to help save the bees. The last photo of the bee on the monarda is really nice. Excellent article! Everyone should read this. We sure need our pollinators! And I think the Bumble Bee is the prettiest. Didn't know the Honey Bees were immigrants to the US - very informative post! Beautiful post Gail. The photos are gorgeous. I agree, it seems the native pollinators are often overlooked. The little carpenter bee is a female Southern Carpenter Bee. Someone on bugguide.net recently IDed one for me. Aren't they beautiful? Great post, Gail, I love seeing your bees and flowers. I particularly like the cup plant. I'll have to try your suggestions, I haven't seen too many good insects this year and I;m a little worried about it. oh, Happy Labor Day! Hope you having a nice three-day weekend! Good article Gail. 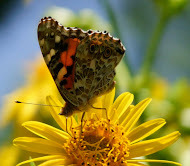 Love all the different pollinators in your photos. Guess many of us have perilla! I've got a bunch of different bees this time of year, but my favs are also the big bumbles (they bounce--HA!). Also love cup plant. It that what you call a carpenter wasp? Great post on bumblees and other bees & wasps. They deserve some recognition for all of the hard work they do! Great post. I love the way the bees know which flowers are best for pollen at any one time and move from species to species a few weeks ago they were all on the Lavatera one was pink with pollen but by the time I'd got my camera it had gone. I watched to see if i could find another but no they are no longer interested in Lavatera busy with Dahlias now so yellow pollen not so interesting as the pink was for photographing. I hadn't thought about bees much before moving here, other than worrying about not stepping on them as a child. But I love them now (except the aggressive, nonnative paper wasps that are trying to take over our neighborhood). And bumbles are my absolute favorite, too. I am definitely tempted to pet them. I'm going to go hit that pollinator link you put in now. I agree, I like bumble bees the best. They are like the teddy bears of the bee world. I really like to see them clinging to a flower like the second photo. I wonder if he was biting a hole at the side of the flower to get the nectar?? I see them do that to the hosta bloom if they are too fat to get inside of them. Fun to watch. I hope you had a great labor day. Your photos are terrific, Gail - I love those bumblebees, too - great information, too. Gail, such a wonderully colorful and informative post! And yes, a very good one to have for Labor Day as they are so hard working. Thanks to blogging, I have been exposed to the wonders of planting more natives and how that can help in saving our planet for future generations. Caretakers of the earth like you and Cheryl and others have done much to spread the word and for that I thank you. :) Keep up the great work-yo are an inspiration to us all. Whenever I hear bumble I think of the lovable Bumble in Rudolph the Red nosed reindeer-not of bees. Too funny huh? I do like the bees but the wasps, now that is another matter altogether. That purple of the flower and bee is wonderful together! Wonderful post about our important garden friends, Gail. We have many of the same pollinators in our garden, though we have fewer bumble bees and many more wasps. I wanted to prune my blooming Black Opal Basil the other day and there were so many bees there that I could only so a small portion of it -- not wanting to take away all their food -- or make them mad! I'm glad to have them. What beautiful photos to accompany such good information. Thank You! I learned a lot from this post, Gail- thanks! Since I started gardening a couple of years ago my attitude toward pollinators has definitely changed - to the point where I found myself trying to save a wasp's nest that I accidently disturbed the other day. Never would have done that before! I love the bumbles too Gail although I can't say I've ever petted them! Did the bumble wake up when you did that? Whenever I see them hanging still on a flower, I always think one of those jagged ambush bugs has gotten them. I'm always relieved when I see they're just sleeping. You have some wonderful info and photos on this post. It would have taken me forever to assemble it all. Kudos to you and Happy Labor Day (even tho it's practically over). ps I leave the amaryllis foliage alone until right before first frost when I bring all the bulbs indoors, cut off the foliage and store them in a dark closet. After that I just check on them off and on until I see signs of life returning then I bring them back into the light. I've heard the bulb needs to have approx 9 leaves to rebloom?? Not sure if that's true or not? I love the humble bumble too. They make me laugh as they greedily try to get every bit of pollen. I was very pleased to read that I am doing my bit to help by leaving my garden messy. Hmmmm, I wonder how I could use that excuse for the house? Very informative post and great photos. I never knew there were over 4000 species of native bees - that is incredible. Hi Gail, I think the bumbles are my favorites too. Like you say, they are often sleeping on a flower early in the morning. They were just to tired to make it back home the night before. I can't resist petting them either. What hard workers, not just bumbles but all bees. I believe there are more of them lately which is a very good thing if true. Gail, thank you for all the insight into bees and pollinators... fascinating creatures, and if we had less to do we might have bee hives for they are uber-abundant in our garden. We laugh out loud some days as the fattest bumble bees straddle a blossom motionless, seemingly drunk with nectar. My brain is buzzing with information! I love bees, especially the bumble bees. You've taken some lovely photos of these hardworking little creatures. This was a very pleasant way to learn something about pollinators. Thank you for sharing with us. I like the word Bumbles...fits the little Buzzers perfectly. Great post and what strikes me most is the very important reminder that all the native bzzers are important to pollination, not just the "nice" ones. A while back, I wrote a little paean to the carpenter bee for the same reason. Beautiful shots of your tiny visitors. Love how the sunlight and sky catches in their wings. That was a lovely post. I love them too - perhaps it's the furry cuddliness and not being associated with stinging that gives them such a good image! Gail - a wonderful post. I love bumble bees, and have posted on them several times. I love the way they irritably wave a leg at oyu if you get a bit close to them, especially when they're dopey, on a cool morning. Gail, our Eastern Carpenter Bees look like bumbles but with no fuzziness on the abdomen. They look like the one on the Monarda. I see a few honeybees all year - but they love anything in the Prunus genus and swarm all over it, including our wild cherries and the cherry laurels. until i ran across some the other day in the cedar glades, and if its blooming in the glades i am there! diverse in color from one plant to the next, I'll have that post up in a day or so- keep up the great work and thank you for causing my second looks at things i normally pass by down at the nursery! Well, I started my day on your blog, and now, I'm finishing up here! Thanks for the cool photos and information. I'll have to click on the link and save it for tomorrow to read. I have enjoyed seeing several kinds of bees and other insects on my blooms. I have lots of bumbles, and have seen them sleeping, too this year. I don't remember who I've already talked about that to. Maybe it was you. Anyway, they do let me get very close and don't seem to mind. Maybe I'll touch one sometime to see how it feels. I also have lots of wasps on my white blooming flowers. I hope they aren't eating all my caterpillars.